While it may seem like a bit of a novelty these days, the era of the autonomous car is fast approaching. And the implications for business, marketing and everyday life are astounding. Fasten your seatbelts. A driverless vehicle will look very different inside. First, there will be no need for a driver's seat. That means the interior of cars will become modular. Seats will be able to turn into beds for long journeys. Or front seats will be able to swing around and a table could pop up for business meetings. Or a car could convert into your mobile office complete with a desk. Commutes will become productive. 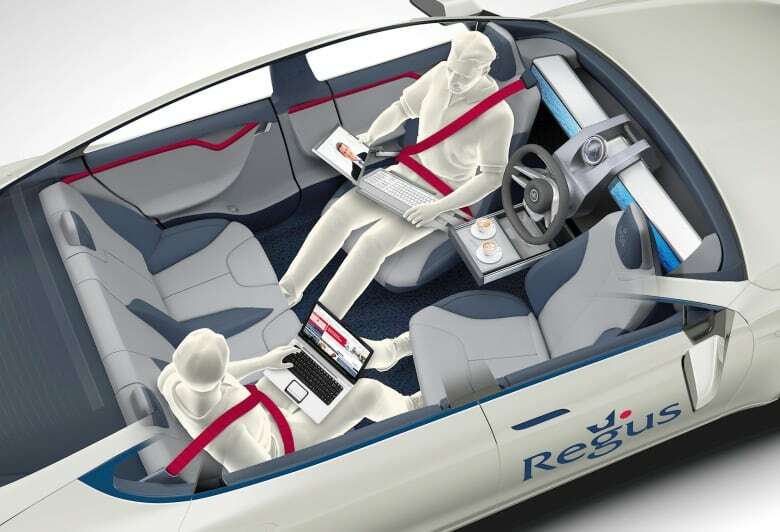 Potential configuration of a driverless car's interior. If you no longer have to drive, why not use the time to get rid of a spare tire. There is a possibility that self-driving cars could transform into fitness pods with fitness equipment. You can do your 20-minute workout on the way to work in the morning. A boon for fitness equipment manufacturers. There will be giant screens in cars of the future, and vehicles will be completely Internet-connected. So you can tap Netflix on the way to work. Or catch up on your favourite TV show. That means cars will be able to convert into theatre-mode seating with a surround sound immersive experience. Cars of the future may even be built out of different materials, especially if the danger of collisions drops drastically. There might be much more window area to enhance viewing since you no longer have to keep your eyes on the road. You will also be able to program personalized sightseeing tours. Just punch in the itinerary on the screen, sit back and enjoy the sights. That means tour operators will have to evolve and market very different services in the future. Those giant in-dash touch screens will present huge opportunities for marketers. As a matter of fact, there will be a big corporate fight to control the dashboard of the future. Your screen will be full of branded apps. So you'll be able to place your order at Starbucks with the tap of an app, then your car will find the closest drive-through to pick it up. Online shopping will increase as people will have more time to peruse their favourite retail websites as they travel. Online shipping will get more efficient, as we mentioned earlier, with self-driving delivery vehicles. Vehicles will deliver packages to vehicles. The advertising industry loves a captive audience, and in-car screens offer a myriad of advertising opportunities. If you need to buy an item, you'll be able to touch the screen during a commercial, your car will quickly source the nearest store and employ GPS to get there. Or send the item to your home. The elderly and the disabled – who often lose the freedom to drive – will be much more mobile and therefore could do more shopping and traveling if they choose to. As driverless cars free up time to work, exercise or sleep, many people will choose to drive to their travel destinations instead of flying. As Audi Vice President Sven Schuwirth says: Your car will wake you up at 4am, pick you up and drive you autonomously the entire way from Munich to Berlin. You can sleep, you can prepare for your meeting, you can call your friends and family, do whatever you want, and enter Berlin in a very relaxed mood. Google's self-driving car shown during a demonstration at the Google campus. (Associated Press) Suddenly, short-distance air travel won't seem worth the hassle or price. Which is also a big problem for the hotel industry. People on longer drives, say from Toronto to Florida, might not stop overnight at a hotel. They'll choose to sleep…in their car bed. It's cheaper, easier and gets you to point B faster. Roadside hotels and motels will suffer, because the convenience factor they rely on won't be so convenient anymore. And that's a major theme you'll notice throughout many industries: flying to Halifax won't be convenient. Stopping at a hotel won't be necessary. So these industries will have to recalibrate their marketing and focus their energy on enticing customers with an experience. Giving them something they can't get in their car. Something that makes them choose to stop and pay extra. That kind of thinking also poses a huge problem for the fast food industry. With driverless cars taking you seamlessly to your destination on the fastest route possible, fewer people will detour and impulse buy at, say, McDonald's. Restaurants off the highway near gas stations will suffer, because driverless cars will mostly be electric. So, like a Roomba vacuum cleaner, they'll head to designated charging stations on their own when they need to. 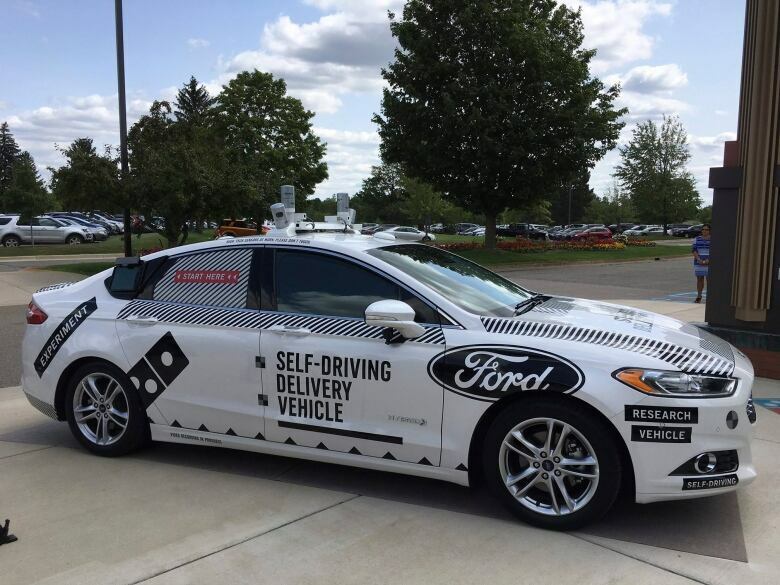 Domino's self-driving pizza delivery. (Dee-Ann Durbin/Associated Press) The Tim Horton's near the gas station without charging stations will no longer be a convenient stop. But autonomous cars will also benefit the fast food industry. 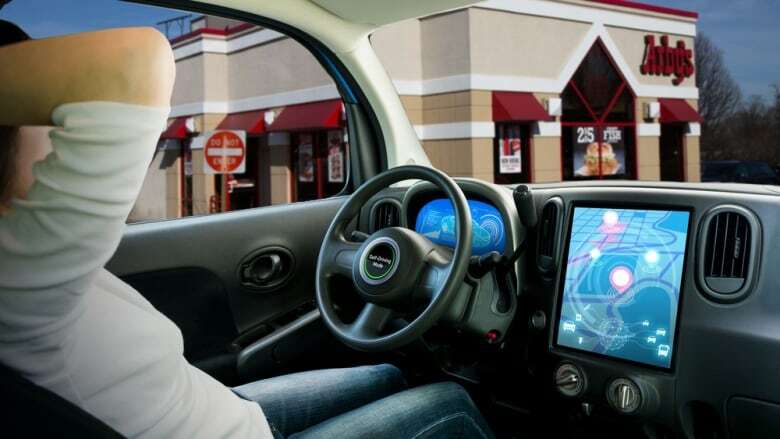 Driverless delivery vehicles will be able to cook food in the car as it travels to your house. This means a hot pizza will be pulled fresh out of the oven just as it pulls up to your front door. It also means fewer trips back and forth to the restaurant for the delivery car. Something Pizza Hut and Domino's are already experimenting with. 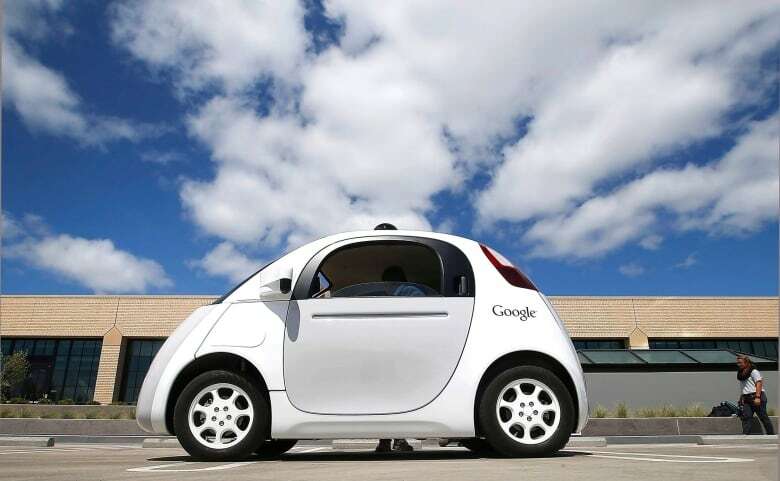 In the future, autonomous cars will even be able to run our errands. Whether our dry cleaning has to be dropped off or our groceries have to be picked up, we'll be able to send our cars out to complete the tasks for us. Say goodbye to the Honey-do list, and say hello to the Honda-do list. It's going to be a brand new world.